Trans - Continental Textile Recycling Ltd.
Trans-Continental Textile Recycling Ltd (TCTR) is a British Columbia owned and operated company that has processed recycled textiles since 1990. Over fifteen years ago TCTR developed a locally based recycling programme that enables the public to recycle their unwanted clothing and, by doing so, help generate hundreds of thousands of dollars annually for local charities, schools, and non- profit organizations. 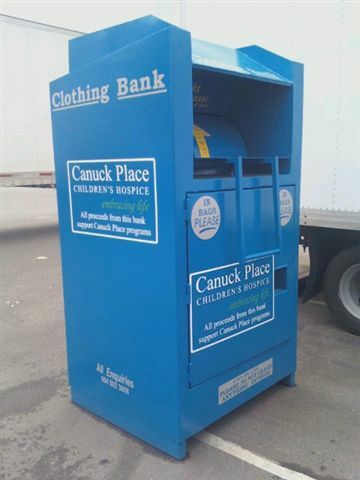 TCTR is unique as it offers the only collection service that funds a broad spectrum of locally based charitable organizations and the only organisation in BC that takes full responsibility for the complete processing and distribution of all the textiles collected, from usable clothing to industrial wiping rags and textile waste. We also offer confidential and environmentally responsible solutions for the disposal of uniforms, promotional clothing and other clothing and textile items that are no longer required and that require specialized handling. Trans-Continental creates jobs here, in Canada All material is processed in Canada. Not one pound of unprocessed material is shipped out of Canada. 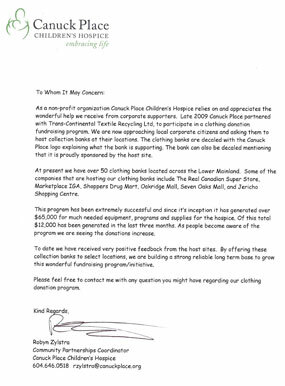 Fastball Team Clothing Drive – A Big Success. Over 6,000 lbs Collected over $1,400 Raised. Click here for details. © 2015 Trans Continential Textile Recycling Ltd.